NASA’s Mars rover Curiosity has apparently made a discovery “for the history books,” but we'll have to wait a few weeks to find out what the new Red Planet find may be, media reports suggest. 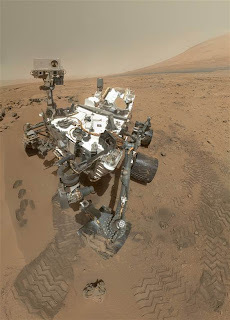 The discovery was made by Curiosity's Sample Analysis at Mars (SAM) instrument. SAM is the rover's onboard chemistry lab, and it's capable of identifying organic compounds—the carbon-containing building blocks of life as we know it. SAM apparently spotted something interesting in a soil sample Curiosity's huge robotic arm delivered to the instrument recently. “This data is gonna be one for the history books,” Curiosity chief scientist John Grotzinger said. “It's looking really good.” Grotzinger said the rover team won't be ready to announce just what SAM found for several weeks. The scientists want to check and double-check the results, to make sure they're for real. Do you think there was ever life on Mars? And, what do you think this discovery is? I like this site..Its nice and it gave us lots of ideas..Thanks for sharing great info. on adventures of travels. You helped me in various situations because many times I have found the useful information which was really important for me in your site. Reading your post I have known many new things about the web application prototypes. You have a point. Very insightful. A nice different perspective. This blog is fantastic. Thats not really a really huge statement, but its all I could come up with after reading this. You know so much about this subject. So much so that you made me want to learn more about it. Your blog is my stepping stone, my friend. Thanks for the heads up on this subject.